After a terrible 2015, here's what SunEdison Inc has to do next year to recover. SunEdison Inc (NASDAQOTH:SUNEQ) has had a rough year, to say the least, in 2015. The former hedge fund favorite has dropped 86% this year, and it's easy to see how losses and leverage could lead to its eventual collapse. But there are some moves SunEdison could make to survive, and even thrive in the future. Here are the biggest questions the company needs to answer in 2016. Will yieldcos return to form? When SunEdison's stock started to fall apart in June, it wasn't a surprising earnings report or a bad news statement that caused the fall. It was the decline of the company's two yieldcos, TerraForm Power (NASDAQ:TERP) and TerraForm Global (NASDAQ:GLBL). SunEdison was going to use these yieldcos as a place to drop down renewable energy assets as they were built, and the yieldcos were counting on access to public markets for both equity and debt financing to buy those projects. As stocks fell, the house of cards SunEdison had built crumbled. Recently, there's been a slight recovery in those yieldcos, most importantly TerraForm Power. In 2016, if there's a further recovery, we could see the yieldco model become a profitable one again. If yieldcos don't recover, SunEdison will have to find other options. Can selling renewable energy projects make money? Even if yieldcos do recover in 2016, we'll see SunEdison start selling more projects to third parties. This was the strategy change announced this fall, but it's unknown if SunEdison can actually make a profit selling projects to third parties. Third-quarter results fueled this question for investors. Gross margin for renewable product sales was negative, and even after adjusting for the materials/poly business, the gross margin for system sales was just 15%. That's well below competitors' and would require $9.7 billion in annual sales to pay for interest and operating expenses alone. In 2016, SunEdison has to prove it can make a significant amount of money selling projects to third parties. If it can't, we may see funding for future projects dry up. 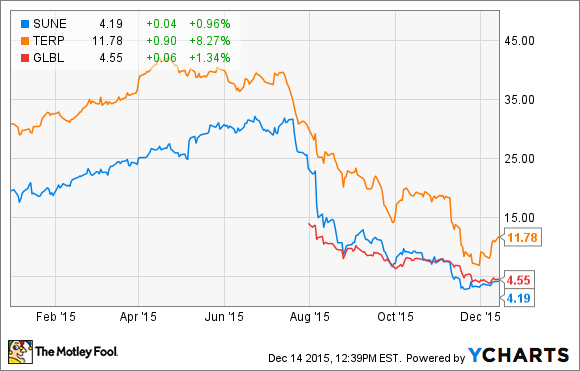 Will debt markets open up for SunEdison? Execution on projects will be important for SunEdison, but it may not matter if debt markets don't open up to the company. With $12 billion in debt overall and $7.9 billion at the parent company, there's a need to fund SunEdison's growing ambitions. At the end of the third quarter, $1.7 billion of debt at the parent company matured within a year, and $1.1 billion matured between one and two years. This debt will need to be refinanced along with funding 5.5 GW of projects in backlog at the end of last quarter. If debt markets demand higher returns, or shut off altogether for SunEdison, we could see the company implode rather quickly. It's hard to tell whether or not SunEdison will be able to turn its business around in 2016. The answer could depend on what buyers of renewable energy projects are willing to pay for the company's projects, which will drive third-party sale margins and access to further capital. A lot has to go right for SunEdison in 2016, and that could happen, but it's a risky bet, and not one I'm willing to take right now.